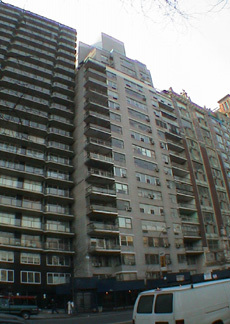 Vornado Realty Trust and the Clarett Group appear to have reached a settlement with rent-stabilized tenants at 220 Central Park South that they want to tear down and replace with a proposed new condo tower, according to an article December 22, 2010 by Laura Kusisto at therealdeal.com. Vornado and Clarett bought the 20-story rental apartment building in 2005 for $131.5 million and have been trying to vacate it so they can erect a 41-story residential condominium tower. "They were originally offering tenants, including Corcoran's Leighton Candler, $1 million to vacate the building," the article said, adding that "now, according to city records, 15 such holdouts, including Ms. Candler, have been bought out for between $1.3 million and $1.56 million." "Despite notable setbacks for landlords trying to vanquish rent-stabilized tenants (see: Stuy Town), the developer in this case has been winning legal battles, and now appears closer to winning the war," the article continued. The light-gray brick building was erected in 1954 and was designed by Mayer & Whittlesley and M. Milton Glass. It has 124 rental apartments. Mayer & Whittlesley also designed 40 and 240 Central Park South, which, like 220 Central Park South, are through-block buildings that extend to 58th Street. There is very good public transportation nearby as well as good local shopping. The Lincoln Center for the Performing Arts is a few blocks away to the west and north. There is considerable traffic. The views to the north are sensational. A November 12, 2009 article by Joey Arak at ny.curbed.com noted that "over the summer a permit was filed to underpin the building in conjunction with a new adjacent project...Extell's project at 225 West 58th Street from architects Cetra/Ruddy," adding that SLCE is the architectural firm for Vornado and Clarett for 220 Central Park South. Another article by Mr. Arak September 15, 2010 noted that broker-blogger Andrew Fine observed that he had "counted what looked like at least 8 to 10 holdouts including one who is clearly having difficulty parting with a lush, south-facing terrace." An anonymous commenter at Mr. Fine's website, afincompany.blogspot.com, November 30, 2010, said that "there are 24 rent-stabilized tenants that have been resisting the 'demolition eviction' for four and a half years now." "They are not holdouts. They are tenants fighting to save their homes. Many of them have been living in this building for over 30 years. Some are quite elderly (70s and 80s)....The rest of the tenants, perhaps another 15 units are month-to-month renters that are either employees, family, or associates of Vornado or Clarett." An April 7, 2009 article in The New York Post by Steve Cuozzo said that "the state Appellate Division - the same folks who recently clobbered Tishman Speyer by ruling that deregulating rent-stabilized apartments at Stuyvesant Town and Peter Cooper Village was illegal - just helped Vornado Realty Trust and Clarett Group get out of a pickle with their own tenant antagonists." "The development partnership, known as Madave Properties SPE," the article continued, "had been stymied by two different court cases before the same judge in its quest to vacate 220 Central Park South in order to demolish it and replace it with a new apartment tower. But last week, the Appellate panel unanimously reversed a lower-court ruling that could have indefinitely stalled the already behind-schedule razing of the 22-story rent-stabilized, white-brick apartment building between Broadway and Columbus Circle....Under state law, the Division of Housing and Community Renewal may permit a landlord to deny lease renewals to rent-stabilized tenants in buildings to be razed as long as certain requirements are met. The developers began buying out tenants and sought the DHCR's blessing not to renew leases of those still at 220 CPS in May 2006. But the agency held off while an unrelated lawsuit involving DHCR and similar applications at certain buildings owned by a different developer wended its way through the courts. In that case, first heard by Manhattan Supreme Court Justice Paul G. Feinman, tenants claimed DHCR's rules did not adequately define what was meant by the word 'demolition' - and Feinman agreed with them. 'The Appellate Division reversed Feinman last June, but the delay had by then cost Vornado and Clarett a year. Then, during the same month, Feinman sided with 20-odd remaining tenants of 220 CPS in a suit they filed in 2007, arguing that DHCR should produce an environmental impact statement before allowing Madave to deny lease renewals in preparation for demolition. Although Feinman's ruling didn't require DHCR to get an EIS, it would have allowed the tenants to continue pressing their claim to make the agency do so - a process that could have delayed the project for years more. The developers opposed the decision for obvious reasons. DHCR also took issue with it on the basis that the agency lacks expertise to conduct an environmental impact study and that environmental review is not part of its mission. But Madave, represented by Rosenberg & Estis' Luise A. Barrack, and the DHCR, repped in-house by Sandra A. Joseph, won on appeal last week. The Appellate judges said DHCR's discretion in granting a non-renewal application is limited to matters specifically cited in rent-stabilization law - such as whether a developer has the money to complete demolition and whether it complies with rules regarding relocation and compensation for stabilized tenants. Barrack called the decision "a ray of hope for owners and developers" of all rent-stabilized buildings staggered by the appellate court's ruling last month against Tishman Speyer at Stuyvesant Town - a case that hung on interpreting J-51 tax-abatement rules -- and by various anti-destabilization bills pending in Albany....She said DHCR is handling about 40 applications from landlords seeking approval not to renew stabilized leases at locations they plan to raze and rebuild. The 220 CPS tenants' lawyer, Jack Lester, said, 'The issue is significant enough' for them to try persuading the Appellate judges to let the case go to the Court of Appeals, the state's highest - a step rarely allowed when an Appellate ruling is unanimous, as it was in this case."